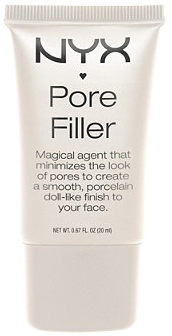 The NYX Pore Filler is a popular choice for many, but I wasn't 100% impressed by it. First of all the packaging is not good at all. It's cheap looking and it wears and stains super easily. The actual wear of this product is also not great, it has a super powdery texture, so it wears off quickly. It's not a primer, so you have to prime before AND after in order to get it to last. It does however absorb oils, and it does fill in pores really well. I just wish it had more of a priming effect and balm like consistency. A little goes a long way so you won't run out of this anytime soon.